Laurence James Lucas, visionary mapmaker of human consciousness and its evolution, is a modern-day mystic and astrological consultant, who has been working successfully with clients for over 25 years, offering individual astrology-based consultations as well as shamanic ceremonies. Since 1994, he has also been giving talks and workshops to groups on a wide range of subjects, including the evolution of human consciousness and its relevance to each participant’s life—particularly in regard to times of transition—as well as the implications of the 2012 effect, the Mayan Sacred Calendar, contemporary shamanism and visionary astrology. Laurence’s empirical research in the areas of cutting-edge astrology, sociology, human psychology and consciousness has given birth to his groundbreaking integral model, the Enchantments of Life. 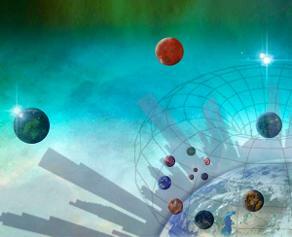 This cosmological view enables a sophisticated understanding of the emerging planetary consciousness and the accompanying planetary civilization. Laurence’s vocation is built upon a foundation of daily practice, involving yoga, qigong and shamanism. His Enchantments of Life, Storyteller, Mayan Sacred Calendar, 2012 series of workshops and astrology-based courses have been highly acclaimed in both Hong Kong and the UK. He lives on Lamma Island, Hong Kong, with his wife Carey and their dog and cat. Laurence works with individual clients and small groups from his dedicated workshop space in his home, as well as in a number of venues in Hong Kong. He also visits the UK at least once, and sometimes twice, a year. He works very successfully with overseas clients using Skype.